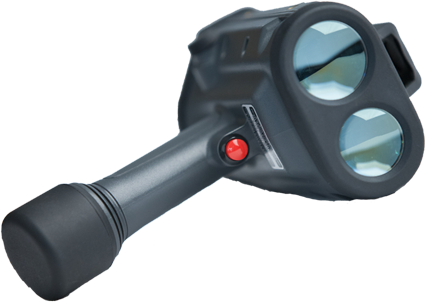 Designed to be the new leader in law enforcement speed measurement, DragonEye hand-held Lidar is rugged, light-weight and easy to use. It’s the Lidar that’s a perfect fit for your traffic monitoring and enforcement needs. DragonEye Speed Lidar provides superior long-range vehicle acquisition and performance in a lightweight package. True color, heads-up display for fast, long-range operation, accurate up to 6000 ft (1828 m). Floating optical bench structure with four-point external rubber cushions for superior shock resistance. Lightweight (only 2.5 lbs with batteries) and extremely well balanced with a comfortable grip. Operates for 24–32 hours on two standard C-cell Alkaline or NiMH rechargeable batteries. Advanced anti-jamming allows speed readings when other units are disabled. Obstruction mode allows targeting through tree limbs, wires, and fences. DragonEye Compact Speed Lidar achieves the perfect balance of features, package size and performance. True color, unity power heads-up display for rapid target acquisition up to 3000 ft (914 m). Unique vertical hand grip and rubber brow pad for steady aiming provide hours of comfortable speed enforcement with less arm and eye strain. Extremely lightweight (1 lb.) and compact for easy storage. Equipped with proprietary anti-jamming algorithms.